With the introduction of our plantain chips, Olu Olu made its foray into the gourmet snack food market, determined to take the little known delicacy mainstream. Relegated to the “international foods” aisle in supermarkets, many are still unaware of this flavoursome-nourishing snack. We have taken the nutritious plantain vegetable and created the lightest, crispiest, most alluring snack to hit shop shelves in a long time. The sheer freshness and authentic flavours of Olu Olu Plantain Chips has made it arguably one of the most sought after in Europe, America and Africa. Olu Olu Plantain Chips contains high quality natural ingredients that give a fuller, balanced and more exotic taste sensation, coupled with an endearing flavour profile and subtle crunch. Olu Olu provides a variety of flavours ranging from Sweet Yellow Plantain, Sweet Chilli, Green Plantain and Green Chilli. The sweet yellow plantain chips have a uniquely sweet and salty flavour profile while maintaining a savoury crunch, whilst the green plantain has a natural earthy taste profile with a marginally nutty, sweet and salty flavour. People’s appreciation for more sophisticated snacking has been enhanced and Olu Olu accommodated this shift in consumer interest. When preparing for dinner parties and social gatherings, hosts are becoming keen on pairing Olu Olu Plantain Chips with Olu Olu Palm Wine, and in a bid to hone in on this trend, the creative hosts are considering our different varieties of plantain chips and referencing different recipes from Olu Olu’s Fusion Cookbook to create delectable appetizers as entrées for their gatherings. In terms of production, Olu Olu prides itself on creating crisps with the perfect taste and crunch, and with the use of specialist artisan equipment that cooks plantains precisely; the texture, quality and taste is always the same and you don’t get the unpleasant greasiness of most plantain chips. However, many locals say the key to our plantain chips popularity is owed to the soil that the plantains are grown in. The unique thing is that the soil in where the plantain trees are sown was formerly a rainforest. This forest became flooded hundreds of years ago and became a bog. The land was drained in the 17th century and this left the nutritious soil that we now grow our plantain trees on. At Olu Olu, we are proud of our Plantain Chips, not only for its complete lack of preservatives, added sugars, additives, gluten or artificial ingredients, but equally, for the fact that a chips are produced with upmost respect for the fair-trade growers, their communities and the environment. As always, the Olu Olu Label is your guaranteed assurance of premium quality and great taste. These are a few of the many ways we ensure we consistently produce quality gourmet plantain chips with the “Perfect Crunch”. Did you know? 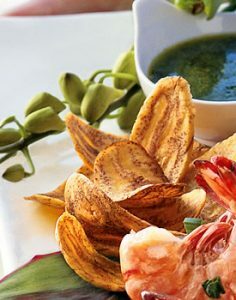 Olu Olu’s Green plantain chips are great with salsa! Olu Olu Gourmet Plantain Chips, many are still unaware of this flavoursome healthy snack. We have taken this nutritious vegetable and created the lightest, crispiest, most alluring snack to come along in a long time. The sheer freshness and authentic flavours of Olu Olu Gourmet Plantain Chips has made it arguably one of the most sought after in Europe and Africa. Cooked only in the purest vegetable oils, Olu Olu Plantain Chips contain high quality natural ingredients that give a fuller, balanced and more exotic taste sensation, coupled with an endearing flavour profile and subtle crunch. Olu Olu provides a variety of flavours ranging from Sweet Yellow Plantain, Sweet Chilli, Green Plantain and Green Chilli. The sweet yellow plantain chips have a uniquely sweet and salty flavour profile while maintaining a savoury crunch, whilst the green plantain has a natural earthy taste profile with a marginally nutty, sweet and salty flavour… You’ve Got To Try Them! 1. Combine the all the ingredients in a mixing bowl. 1. 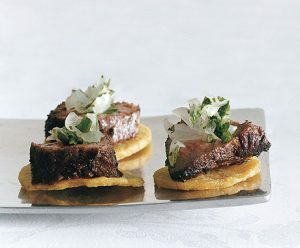 Cut beef into small chunky pieces. Season with pinch of salt and rub jerk paste all over beef. 2. Heat oil in a non-stick skillet over medium-high heat until it shimmers. Add beef and sear, turning, 4 to 5 minutes total. Let rest on a cutting board 5 minutes. Cut into thin slices. 3. Finely chop onions and cilantro together. Top Olu Olu Gourmet Green Plantain Chips with beef, then with onion salsa. 1. Whisk together the dressing. Set aside. 2. Prep your fruit by chopping up your papaya and pineapple. Store the leftovers. 3. Finely chop your frisee. Place in bowl. Add baby lettuce. 4. Toss lettuce gently with 2 Tbsp of dressing. 5. Portion salad into two bowls. Add pineapple and papaya on top of lettuce. Add macadamia nuts. Place plantain chips around edges of bowls. Drizzle additional dressing on top and add fresh black pepper to taste. 1. Place the grouper and shrimp in a large bowl. Toss with the lime and orange juice and let stand for 30 minutes. Strain the grouper and shrimp and place in a separate bowl. 2. Add the tomatoes, cilantro, onions, chiles, mango, salt and pepper and toss gently to combine. Drizzle with the olive oil and toss. 3. Place the ceviche on a serving platter or on individual plates. Drizzle with a bit more olive oil. Garnish with lime zest and serve with plantain chips and spiced popcorn. 1. Place oil in a 3-quart saucepan over medium-high heat. Attach a deep-fry thermometer to side of pan, and heat oil to 380 degrees. Carefully drop plantain slices into oil one at a time. Cook in batches until golden brown. Transfer to paper towels with a slotted spoon; let drain while finishing batches. (Adjust heat to keep temperature constant, if necessary, during cooking.) Sprinkle with salt; set aside. 2. Make dip: Place banana, avocado, and lemon juice in bowl; mash with fork. Season with salt; serve with plantain chips. • Trim off ends of plantains and cut 4 vertical slits in skin of each (do not cut into fruit). Microwave for 1 minute at 50 percent power, then pull off peel. Cut diagonally into thin (scant 1/8-inch) slices. • Pour both oils into 3- to 4-inch-deep medium saucepan. Attach deep-fry thermometer to side of pan and heat oil to 350°F over medium heat. Working in batches, carefully add several plantain slices to hot oil. Cook until golden brown, turning occasionally, about 4 minutes. Using slotted spoon, transfer chips to paper towels to drain. Sprinkle with salt and pepper; cool slightly. Serve with Warm Cilantro Dipping Sauce. • Blend first 4 ingredients in food processor until cilantro is finely chopped, about 15 seconds. Transfer mixture to medium heatproof bowl. • Heat oil in medium skillet over medium heat until hot; slowly whisk into cilantro mixture. Mix in hot sauce. Season sauce to taste with salt and pepper; transfer to small bowl. Serve with plantain chips. DO AHEAD Dip can be made 2 hours ahead. Let stand at room temperature. 4. Combine the all the ingredients in a mixing bowl. 6. Add the limejuice and olive oil. Mix together and serve as a dip for your chips.